Aluminum can collecting is not only good for the environment, it can be profitable too. Because aluminum is infinitely recyclable, it’s a valuable commodity, and one aluminum recyclers are willing to pay for. Whether you want to collect cans out of a desire to make the world a cleaner place, or have motives that are more monetarily driven, the world is full of cans for you to collect. The simplest method of collecting cans is the one you start at home. If you’re a typical American family, you can probably collect quite a few cans—the average American family recycles 150 six-packs each year, reports the Can Manufacturers Institute. The specific method you use depends on the reason you’re recycling. 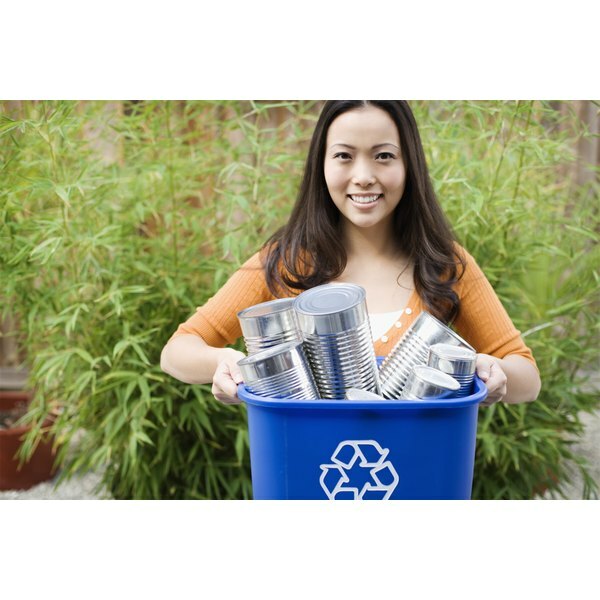 If you simply want to keep cans out of landfills, see if your community has a curbside recycling program. If you want to make money for yourself or collect for a charity, set aside a separate trash can or bag, and mark it carefully so your family knows not to put regular garbage there. The typical American workplace is full of aluminum cans. The workforce has to stay awake somehow, and often that “somehow” comes in the form of a beverage packaged in an aluminum can. The average employee consumes 2.5 cans of soda each day at work, says the Can Manufacturers Institute. Put a box or bin in the break room, and near all trash cans. If you’re really industrious, you may want to take a look at individual trash cans at the end of each day, since sometimes it’s just too much work to get up and walk to the recycling bin. Almost any place where people gather for recreation can be a treasure trove of aluminum cans. This doesn’t necessarily mean Dumpster diving—although if you’re truly dedicated, Dumpsters and trash cans are certainly a viable source of cans. Just think in terms of public places where people drink a lot and may or may not throw their cans in the trash afterward. Public pools, parks and sports fields are all good candidates—people leave cans sitting under bleachers or near their seats, or even next to trash cans when the cans fill up. The sides of roads are a source of cans, as people may simply throw them out their car windows. Beaches, too, are a place where beverages are consumed and cans discarded—and sadly, not just in trash cans. The Ocean Conservancy’s 2009 International Coastal Cleanup collected more than 450,000 beverage cans from beaches in 108 countries. Liz Turner has been writing since 1994. Her work has been published in several technology publications and local newspapers, as well as on eHow and LIVESTRONG.COM. She has writing and editing experience in technology, business, children's issues, travel, animal care, beauty, health and fitness topics. She has a Bachelor of Arts in English from the University of Central Florida.